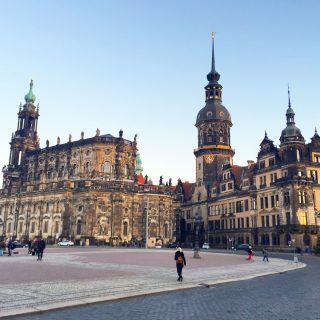 The historic Altstadt is the main attraction in Dresden, with its beautifully restored Baroque buildings, bustling squares and charming cobblestone streets. 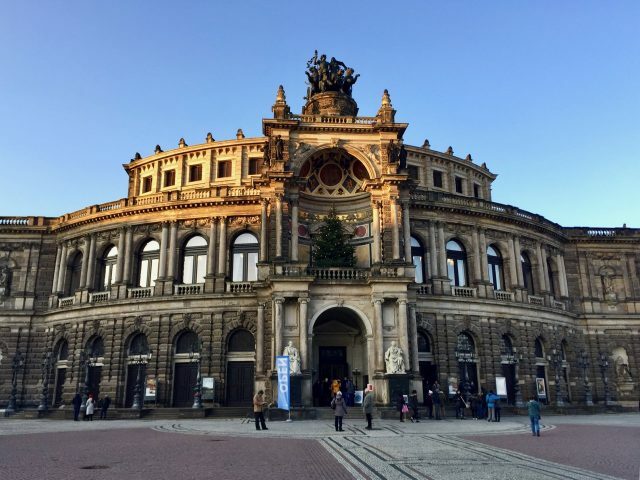 Many of Dresden’s most famous museums and cultural institutions can be found here, all within easy walking distance of each other. I suggest a leisurely stroll that includes the Royal Palace, Neumarkt (one of the city’s main squares) and the iconic Frauenkirche (Church of Our Lady), the Zwinger Palace, the Stallhof and the Procession of Princes (a 101-meter porcelain mural; one of the few historic treasures that miraculously escaped practically untouched during WWII), the Cathedral, Semper Opera House and Brühl’s Terrace (built in the 18th century as Count Brühl’s private gardens overlooking the Elbe River). The Dresden Cathedral in the Alstadt. The Procession of Princes mural. Grand monuments along Bruhl’s Terrace. Brühl’s terrace overlooks the Elbe River. The Cathedral tower and Semper Opera House can be seen in the background. The grounds of the Zwinger Palace. You can also opt for a private guided tour of the Altstadt. Or a tour which includes a visit to the Semper Opera House. 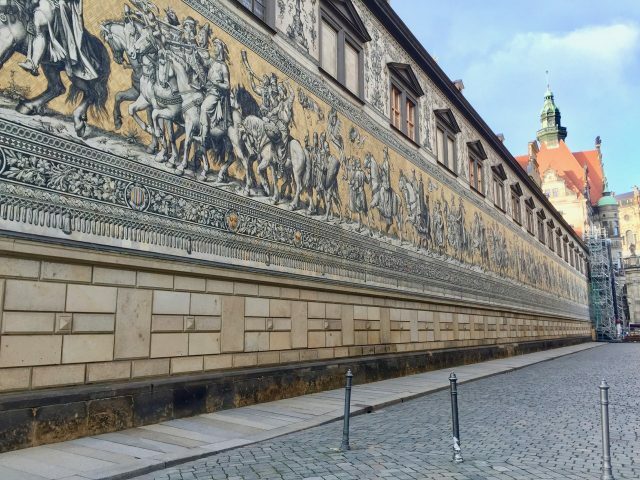 Most visitors to Dresden end up just seeing the Alstadt and its historical treasures but I highly recommend venturing across the Elbe River to Neustadt (the New Town). Directly across the river, you’ll find the Golden Horseman (an 18th century monument), a string of pompous-looking government buildings and museums such as the Japanese Palace but venture further and you’ll discover a vibrant district with cafés, restaurants, bars, art galleries and quirky shops. The Golden Horseman is one of the first attractions you’ll spot when you cross the Augustus bridge to Neustadt. You’ll also find fantastic street art around almost every corner! 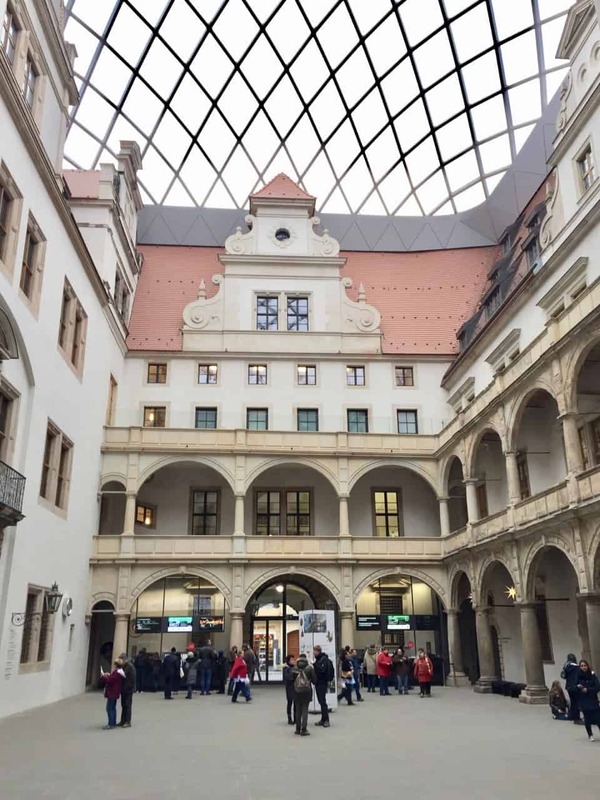 One area to head to is the Kunsthofpassage and the neighbourhoods on either side of the Louisenstrasse. You can also opt to join a street art tour, probably one of the coolest things to do in Dresden. There’s cool street art to be discovered in Neustadt. While you’re on this side of the river, drop by probably one of the most beautiful dairy shops I’ve ever seen: the Dresdner Molkerei Gebrüder Pfund (Bautznerstrasse 79). The Pfund Brothers Dairy shop. Dresden has a variety of vault restaurants that serve local fare. It’s amazing to descend into a basement only to find cavernous, vaulted spaces packed with people having a meal or a few pints of the local brew. 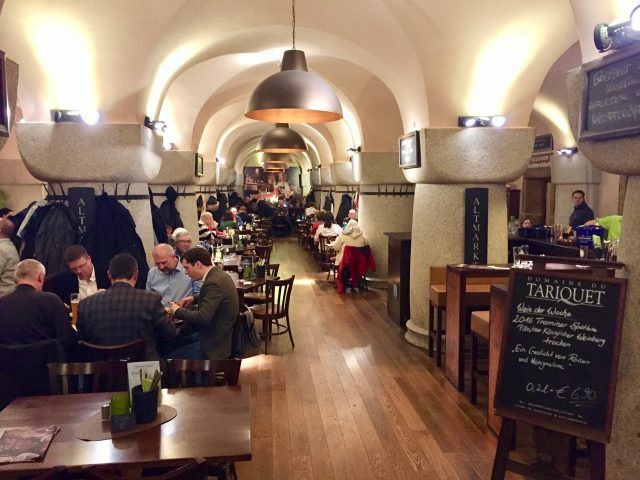 Two vault restaurants I can recommend are Sophienkeller (opposite the Zwinger Palace), Pulverturm (opposite the Frauenkirche) and Altmarktkeller – Dresdner Bierhaus (at the Altmarkt). Raphael’s little angels are famous the world over and you can find them in Dresden! The great Italian master created the painting, the Sistine Madonna, in the 16th century. In 1754, Augustus III of Poland purchased the painting and transferred it to his palace in Dresden. The painting now hangs in the stunning Gemäldegalerie Alte Meister (or Old Masters Gallery) adjacent to the Zwinger Palace. Find these world famous angels at the bottom of the painting. 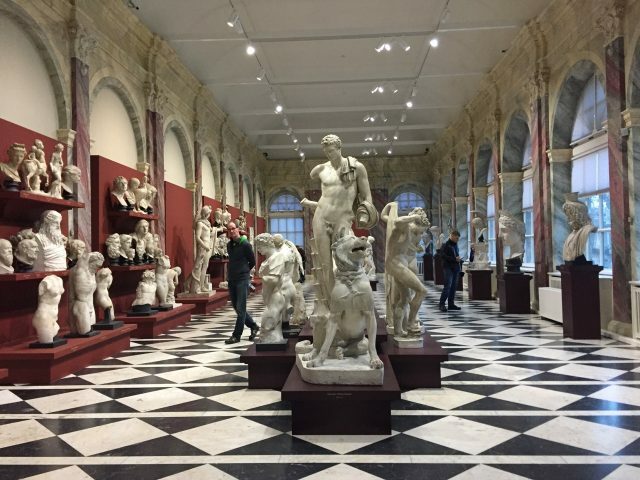 The gallery of statues and busts at the Old Masters Gallery. The Residenzschloss or Royal Palace of Dresden is one of the city’s oldest buildings – it can trace its origins back to the 13th century. 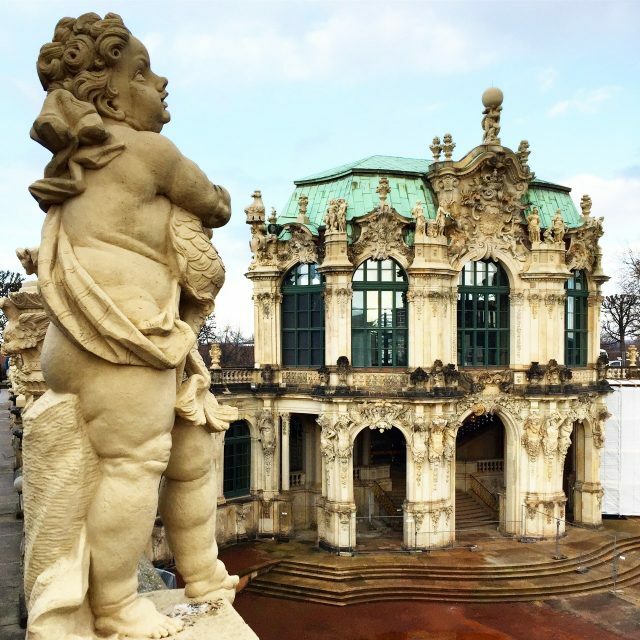 Through the centuries, the palace was the residence of the electors and the kings of Saxony. 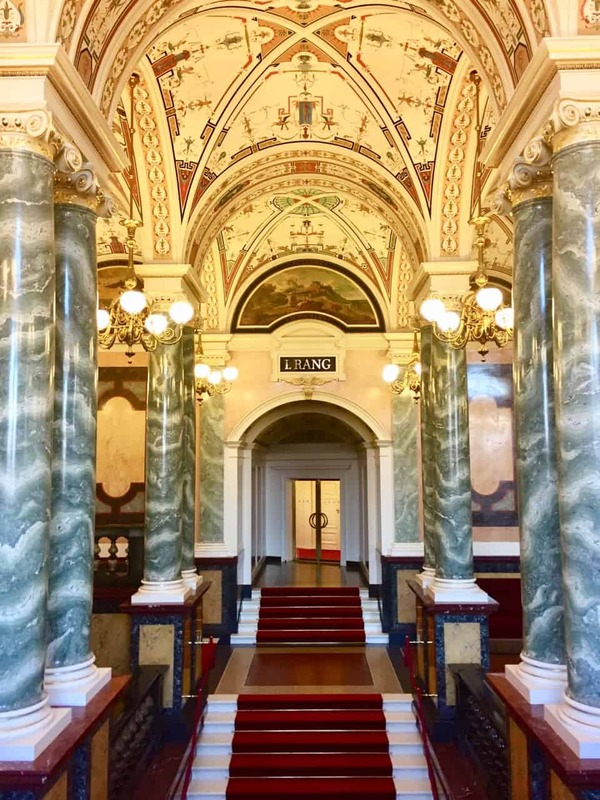 These days, the palace houses five museums: the historic Green Vault and the New Green Vault, the Numismatic Cabinet, the Collection of Prints, Drawings and Photographs, and the Dresden Armory with the Turkish Chamber. The historic Green Vault, with its rich collection of treasures, and the Dresden Armory are truly a sight to behold! The Turkish Chamber displays hundreds of artifacts from the Ottoman Empire, making it one of the most important Ottoman collections outside of Turkey. The main foyer of the Residenzschloss or Royal Palace. 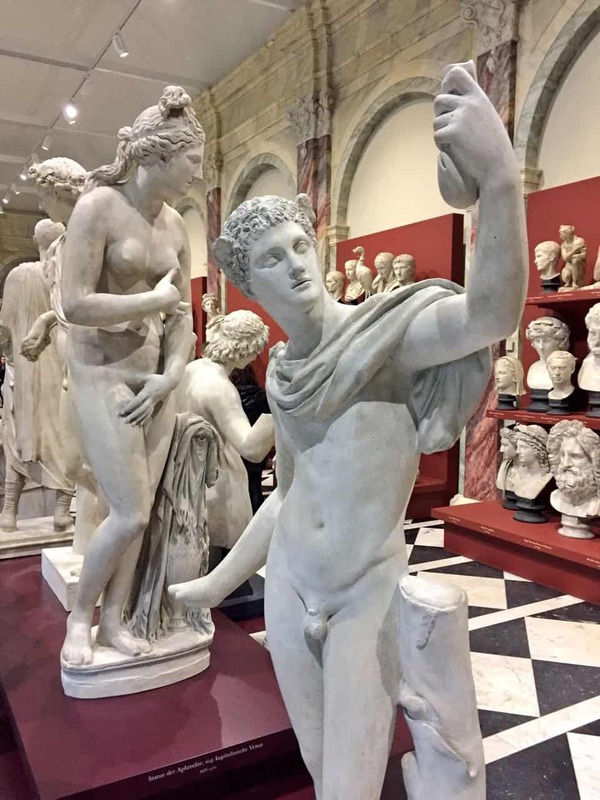 One of the many treasures in the Residenzschloss. 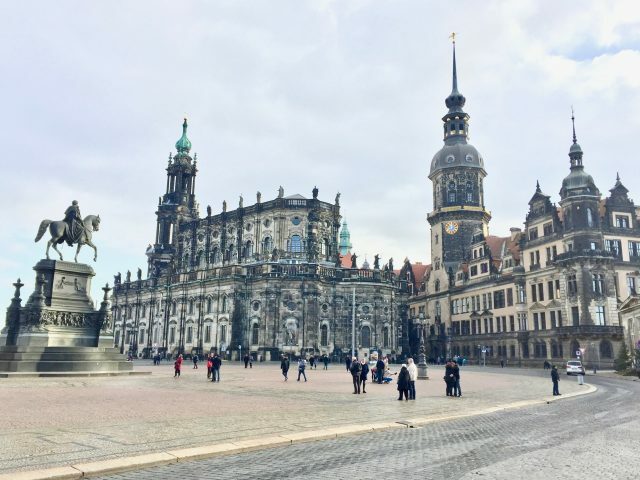 Not many know this but Dresden is home to two castles that formed the decor or the inspiration for the castles in various Cinderella movies. The palace scenes in the 2015 movie Cinderella, with Cate Blanchett and Lily James, were computer-modelled based on the Zwinger Palace in Dresden’s Altstadt. Details of the Zwinger Palace were used in the Cinderella movie. The 1973 movie Three Wishes for Cinderella, was filmed in Moritzburg Castle, located about 15 kms from Dresden. You can get to Moritzburg Castle by bus 326 from Dresden-Neustadt Station. You can also take the historic narrow gauge railway ‘Loessnitzdackel’ from Radebeul to Moritzburg. Moritzburg Palace (image by Davy Doggen). 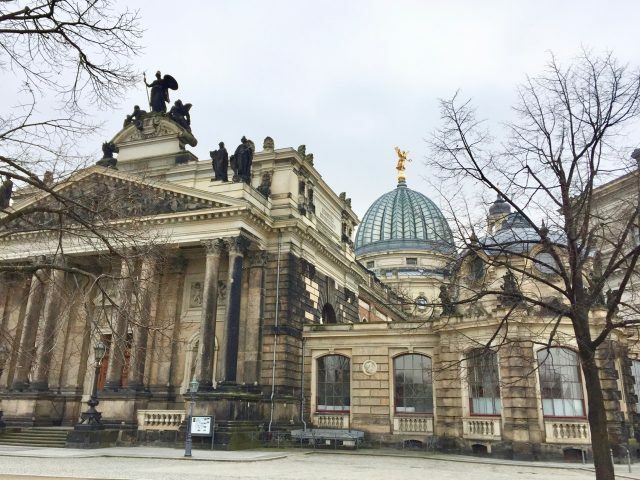 The Großer Garten (or Great Garden) is a massive Baroque-style park just outside the Altstadt. Opened in the 17th century, the park features symmetrical pathways and a little palace (the Sommerpalais). The park is a great place for a stroll past towering trees and expansive lawns. While you’re there, check out the transparent Volkswagen Factory at the edges of the park! The Semper Opera House is arguably one of the most stunning opera venues I’ve ever been to. 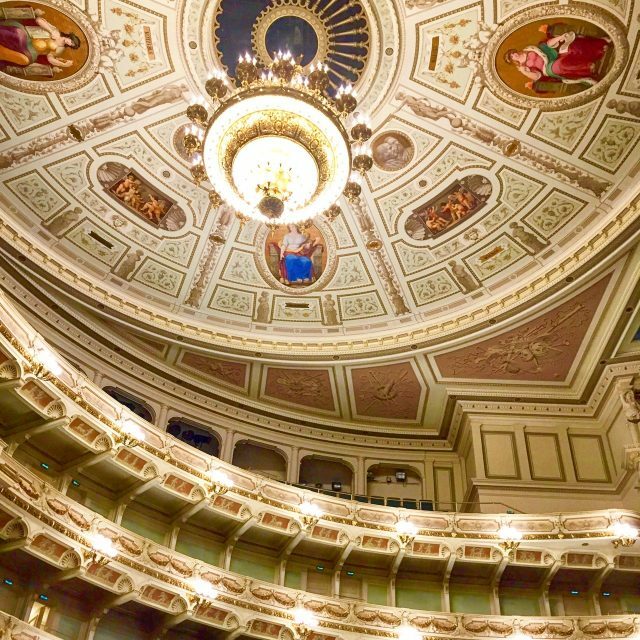 Home to the Saxon State Orchestra, one of the world’s oldest and best-known orchestras, the Semper Opera House is a must-visit, either on a guided tour (there are frequent tours every day) or for one of the performances. Check out the website for more information. The main staircase of the Semper Opera House. The stunning ceiling of the Semper Opera House. The Elbe River to the east of Dresden is an area of vineyards and palaces, making it a great option for a half-day trip from the city centre. 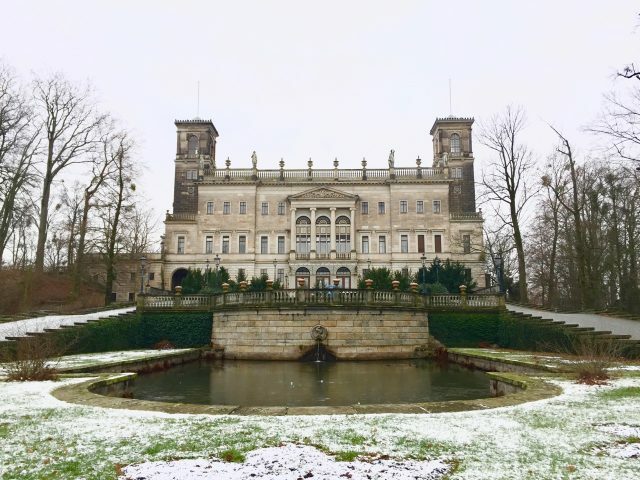 There are three 19th century palaces (Eckberg, Lingner and Albrechtsberg) located practically next to each other which you can visit on foot, passing woodlands and parks between them, and enjoy the beautiful views of the vineyards and the Elbe Valley below. View of the Elbe River, vineyards and Dresden in the background. To get there, take tram 11 to Elbschloesser. You can easily combine a visit to the Elbe castles with an exploration of Neustadt (point 2 above) using tram 11 from/to Albertplatz. The Yenidze factory is one of the more extraordinary buildings in Dresden. Located not far from the Zwinger Palace, the Yenidze was built in the early-20th century as a tobacco factory in the style of a mosque. With its beautiful glass dome and minarets, it definitely looks like a mosque! These days, the building houses offices and there’s a rooftop café and restaurant in the dome. Yenidze factory (image by Thomas Klewe). One more tip: if you love Christmas Markets, then I recommend you plan a visit to Dresden during the Christmas season! The city has some of the most elaborate and atmospheric Christmas Markets in Germany. Read my post about Christmas Markets in Dresden. 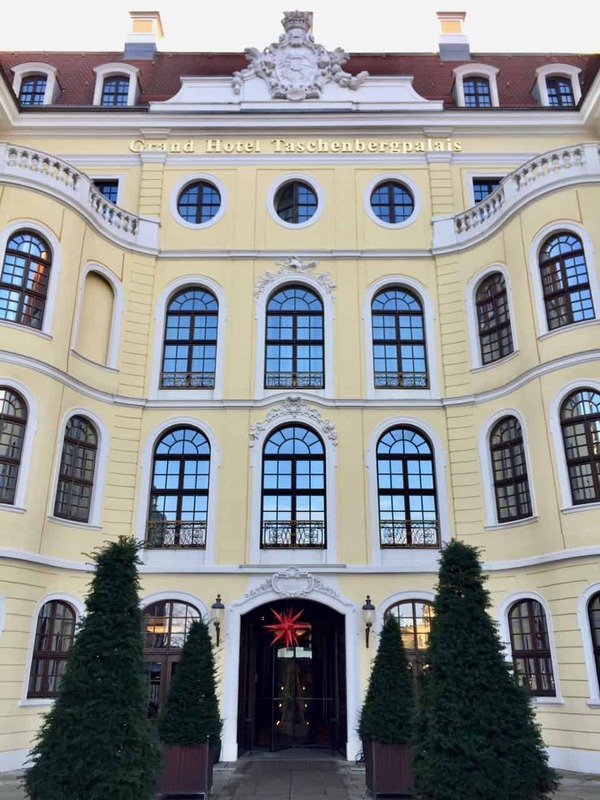 I stayed at the Grand Hotel Taschenbergpalais Kempinski, which is centrally located in the Altstadt, across the road from the Residenzschloss (Royal Palace) and the Zwinger palace, and the Dresden Cathedral and Semper Opera House are literally a stone’s throw away. The rooms are spacious and tastefully decorated. There are several restaurants and bars – my favourites are the Palais Bistro (great French food in a relaxing ambiance) and the Karl May Bar (excellent cocktails in this cozy pub!). Check out rates for this hotel. Dresden has an airport with frequent connections to major cities in Germany and elsewhere in Europe. I flew with KLM direct from Amsterdam. Dresden is also connected by (high-speed) rail and bus services with many cities in Germany. In addition, Prague (Czech Republic) is less than a two-hour drive away. Thanks for your comment! Glad you enjoyed my post. Have a great trip to Dresden. Pretty sure you’ll love it! 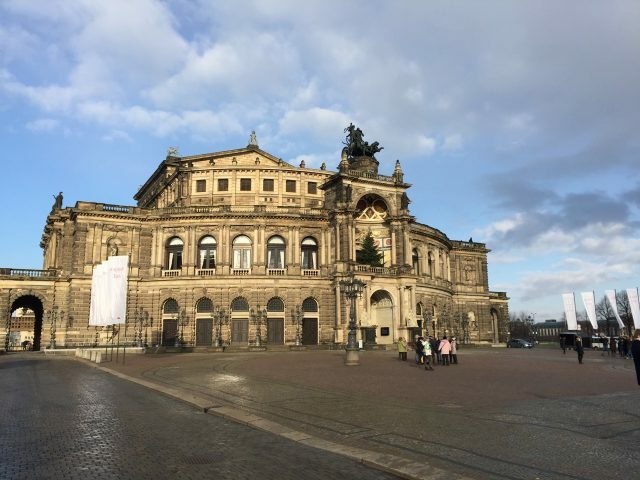 I am returning to Germany in September, and Dresden is my #1 must see city on this trip, with a jaunt to Leipzig. Your photos have my mouth watering a bit with anticipation. Putting all of these places on my list. Thank you!